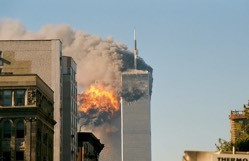 Earlier this year, a federal US judge ordered Iran to pay $6 billion to families of the victims of 9/11 based on US government assertions that various Iranian government entities were accountable for the attacks. On Friday, Al Arabiya, a Saudi-owned pan-Arab news site based in Dubai, published an article covering an interview with Mohammad-Javad Larijani, the international affairs assistant in the Iranian judiciary. In the interview, broadcast via Iranian state TV on May 30, Larijani discussed the role his government played in the 9/11 attacks.